Article and pictures used with permission of Banner News. CLASS ACT: Dr. Shawn Krosnick, Xi Wu, Dr. James Rasmussen, Candace Starr Canady and Kate Curtis-Dockter stand next to the newly installed Licor DNA sequencer that has been in use since the beginning of the semester. The machine was purchased through a matching grant by the Licor Biosciences company and Southern Arkansas University. Although DNA studies are becoming more popular thanks to television programs like “CSI” and “Law and Order,” students at Southern Arkansas University are learning that the study of genetics goes much farther than TV. Three genetics students at SAU, all in the SAU Honors College program, are using a new piece of equipment that sets them apart from students in universities of similar size, said Dr. Shawn Krosnick, SAU assistant professor of biology. 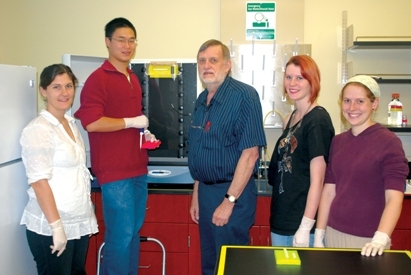 The new $100,000 Licor Biosciences DNA sequencer came to SAU after the Chair of the Department of Biology Dr. James Rasmussen’s grant proposal to Licor Biosciences for a matching grant in 2009. Students Candice Starr Canady, Kate Curtis-Dockter and Xi Wu are using the Licor sequencer in an independent study that not only prepares them for grad school programs, but also teaches them about the hard work it takes to complete professional research. The students’ work is contributing to a larger project of Krosnick’s: studying the genetics of passionflowers to determine the relationships between species. “They are learning these methods and will be able to apply them to any type of organism, not just plants. This is because the techniques for working with DNA are the same, no matter if it comes from a plant or an animal,” said Krosnick. Canady added that she plans to take her new knowledge to grad school. “There aren’t a lot of students who get to work with things like this,” she said. “We’re extremely appreciative,” said Dockter. Krosnick added that she believes science students who are interested in SAU may take features like the new equipment into consideration when looking at what the university has to offer. 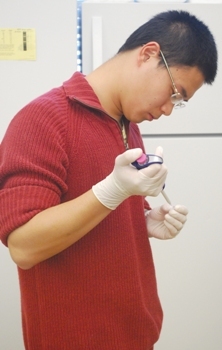 Other equipment like a Polymerase Chain Reaction (PCR) Thermocycler, which multiplies the number of DNA molecules to be read by the sequencer, also had to be purchased and made available to students for their research efforts. Rasmussen said that the DNA in a drop of blood isn’t enough for a sequencer to pick out identifying factors. Those molecules must be multiplied again and again, a process completed by the PCR thermocycler, before there are enough molecules for the sequencer to provide an accurate reading, Rasmussen explained. Krosnick said most of the independent study project in which the students are taking part this semester involves the multiplying of this genetic material in the PCR thermocycler. Krosnick said a new course in molecular biology will begin next semester using the Licor sequencer and that among other things, students will learn how to trace their family lineages through their own DNA.